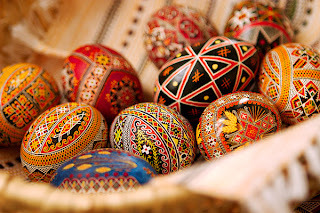 Easter is this weekend and I thought that I would share some photos of East-European Easter Eggs created by two people I had the pleasure of talking to: Martina Krskova and Jindra Maskova. As well as some examples of Pysanka (Ukrainian Easter Eggs). 3D Pernicky (Ginge bread) Easter Egg made by Jindra Maskova (from the Czech Republic). The 3D eggs are hollow on the inside so that you can put small items in the egg like a ring or a message.